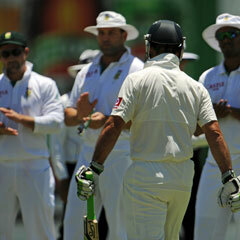 Perth - Despite a cheap dismissal on Monday, Ricky Ponting went out in style, leaving the game as Australia's all-time leading Test batsman after a poignant guard of honour from the South Africans. Not long after the adoring crowd in Perth gave him a rousing sendoff, Australia's most successful captain was soon back in the pavilion with just eight runs as his side chased an improbable 632 to win the third Test. But Ponting, who turns 38 this month, will be judged over the course of a stellar career that equalled Steve Waugh's mark of 168 Test matches - the most in the history of Australian cricket. His South African opponents gave due recognition as he came out to bat on Monday, lining up to applaud him onto the pitch. But in truth Ponting had failed to fire in the current series, and admitted that his time was up. The Tasmanian, who boasts 41 centuries, with only Indian legend Sachin Tendulkar (51) and South Africa's Jacques Kallis (44) scoring more, said ahead of the series decider in Perth that he knew retirement was imminent. "Over the last couple of weeks my level of performance hasn't been good enough," he admitted. "My passion and love for the game hasn't changed but at the end of the day (the decision) was based on my results." Ponting won more Tests as captain - 48 - than any other Australian and has the astonishing success rate of almost 72 percent as the country's one-day leader, winning 164 of his 228 games. He had already called a halt on his captaincy of the Test and one-day team in March last year, but continued as a player. Despite skippering Australia in more than 300 Test and one-day matches, taking over from Waugh, his magnificent innings were blighted by three Ashes series losses as captain. Nicknamed Punter by Shane Warne for his penchant for a bet (punt) on the greyhounds, Ponting amassed 13,378 runs in 168 Tests at 51.85, and 13,704 runs in 375 one-day internationals. As captain, he oversaw a painful transition in Australian cricket following several high-profile retirements, including Warne, Glenn McGrath, Adam Gilchrist, Matthew Hayden and Justin Langer. But even with such greats in the ranks, Ponting, as captain, lost the 2005 Ashes in England, and despite engineering a 5-0 revenge in the ensuing home series in 2006/07, he again lost in 2009 and 2010/11. That last failure was badly received in Australia - it was their first Ashes loss at home for 24 years and followed a series of defeats by Ponting-led teams. Born the eldest of four children in the working-class Tasmanian suburb of Mowbray, Ricky Thomas Ponting was influenced to play cricket by his uncle Greg Campbell, who played Tests for Australia in 1989 and 1990. Ponting went on to make his state debut at 17, the youngest to represent Tasmania in the domestic Sheffield Shield competition, before making his international one-day debut aged 20 in 1995. He only scored one against South Africa in his first match but went on to become one of cricket's batting titans, with his Test debut coming 10 months later in December against Sri Lanka in Perth. Ponting had a rocky beginning in the public eye and was banned for three matches in 1999 by Australian cricket chiefs following an early-morning brawl in a Sydney bar. Married with two children, he is known as a campaigner against cancer and established The Ponting Foundation with wife Rianna to raise money for young Australians afflicted by the disease. Cricket Australia chief James Sutherland described him as one of the best players to ever to pad up, and wants him to continue in the game in some capacity, although Ponting is yet to announce his future plans. Matches 23, Runs 477, Highest 98 not out, Average 23.85, Strike-rate 121.06.